Tile or Hardwood in the Kitchen? 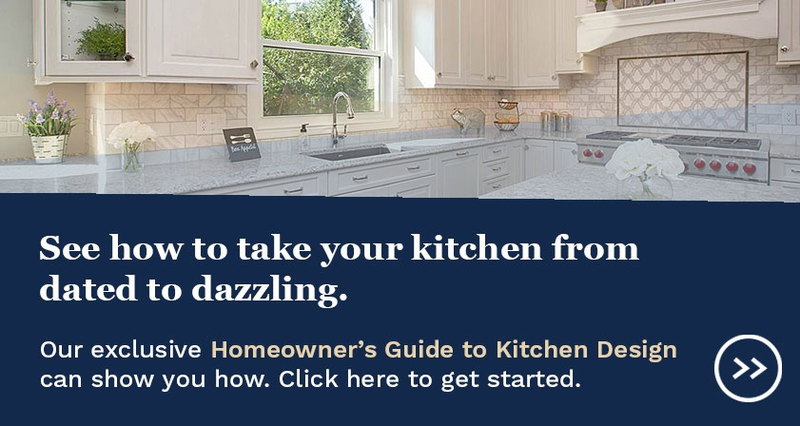 Assuming that you're not particularly interested in keeping that linoleum tile your 1970's forebears installed in your kitchen, the choice between tile and hardwood is probably on your mind as you plan your kitchen remodel. With good reason, since both tile and hardwood bring a lot to the table in terms of style and function. There are pros and cons to both, and certainly examples of each to be inspired by. The ultimate choice, therefore, doesn't come down to "which is best", but "which is right for me and my home". So to help you answer that, here are a few of the major considerations of each for you to compare. 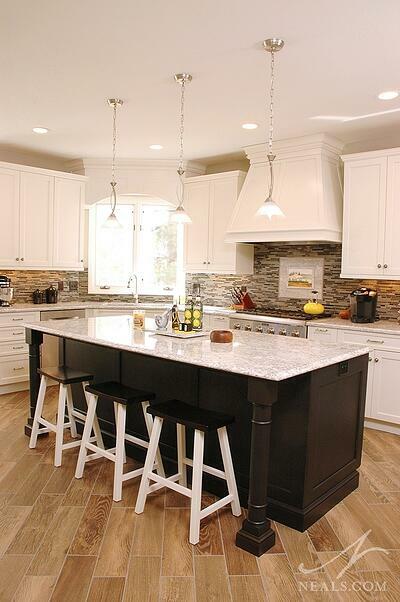 When it comes right down to it, both tile and hardwood can be installed in a kitchen. Where the differences come in, however, is how they each deal with comfort, durability, moisture & spills, and installation. Cream-colored, large format tiles compliment the warm wood and pale granite in this kitchen remodel. When it comes to durability, tile is a winner. The regular wear-and-tear of daily kitchen traffic won't damage the tile. There are some things that can, however. Ceramic tile is made from baked clay which can crack or chip if hit by a heavy or stronger object, and depending on the way the tile is manufactured, it's possible for the surface glazing or color to wear away in high-traffic areas over time. Check the tile's warranty and durability specifications to get an idea of what to expect. Moisture isn't going to have a major affect on tile as long as it has been installed properly and the grout is in good condition. The tile/grout layer creates a barrier over the subfloor, protecting it from the damage of a wet spill. Most tiles will be resistant to stains, but certain types of foods may stain if not cleaned up immediately depending on the nature of the tile's surface. Tile is a hard surface that can be uncomfortable to stand on for longer periods of time. In the kitchen, this is an important consideration for those periods of cooking and cleaning that keep you in one spot for a while. It may be necessary to use cushioning kitchen rugs in those areas, which, of course, means covering up some of the tile. A downside to tile its that it's cold, and can make a room feel cold. The upside, however, is that radiant heating can be installed under tile floors, eliminating the physical discomfort of a cold tile underfoot. A radiant heating system, however, is an added element to your project, with it's own cost and installation needs. Also, be aware that tile can't be installed on a subfloor that gives or bounces, such as a standard plywood subfloor. A concrete slab floor is best, but extra-thick plywood can be used, possibly with added support underneath. If the floor gives too much, the grout or tile will crack, and no amount of patchwork will fix the problem. There are thousands of floor tile products on the market, and most come in a standard sizes that make it possible to nearly endlessly mix and match. This means that tile give you easy options to create designs, patterns and add interesting details in your kitchen floor that can't be achieved as easily using other methods. Tile also isn't limited to a grid, increasing the ability to create a custom floor that is unique to your kitchen and your personality. 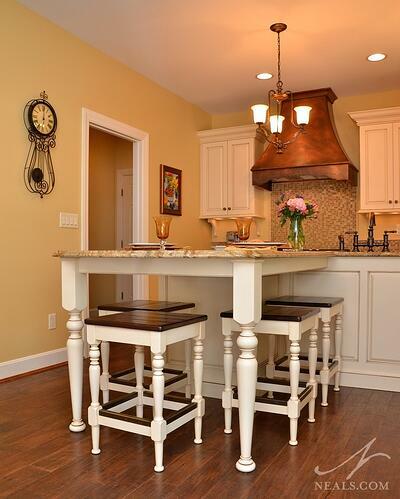 A distressed hardwood floor completes the French Country style of this kitchen. There are many types of hardwood products out there, and each will have its own characteristics in terms of durability and comfort. Again, it's important to look at the specifications for any flooring product you are considering. In general, however, hardwood floors are much more susceptible to damage in the form of scrapes and stains. What in lacks in an ability to heal itself from gouges, however, it makes up for in the way age and use add character and dimension to the floor. Homeowners tend to opt for hardwood flooring because of this timeless quality, and a well-worn wood floor isn't automatically a bad thing. Regular resealing or re-staining can preserve the look of a wood floor in a way that a worn-out or cracked tile can't match. Moisture isn't wood's best friend. When wet spills are allowed to soak in or sit on a wood floor, both the wood planks and the subfloor suffer. Swollen boards can quickly damage or ruin the floor. The best defense against this type of damage is to apply a moisture-resistant sealant, and to quickly clean up spills when they happen. Wood floors can be installed over standard plywood subfloors, or over concrete slabs. Depending on the installation, the boards give in a way that's impossible for tile to emulate, so as you walk across or stand on the floor, the boards respond to the pressure. This makes a hardwood floor more comfortable, but it's still a hard surface flooring material that can be uncomfortable to stand on for a long period. Engineered wood flooring products,which are different from hardwood, can be installed over radiant heating systems, but since hardwood can retain the warmth of the surrounding air, that's not necessarily a con to using it. Wood also provides warmth in a stylistic or aesthetic sense, and makes a room feel more personable and cozy. Wood doesn't always need to look traditional, either. Gray-toned stains can bring a contemporary look to a wood floor. 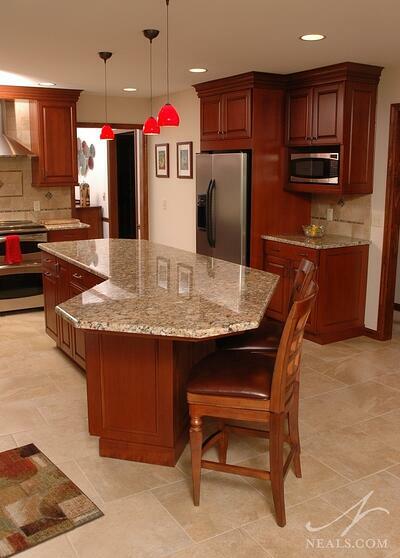 Wood-look tile in this kitchen remodel adds a warm character, but retains durability. One product concept that has gained attention in kitchen (and bath) design in the past few years is a ceramic tile that looks like wood. A wood-grain effect is applied either as a texture or during the glazing process on long, narrow tiles. These wood-look tiles come in a variety of colors and styles, and can even get close to the look of an exotic hardwood, just without the actual hardwood. This type of tile comes with all the same pros and cons as any regular ceramic tile, but provides the look of wood. So it's a good option if the maintenance of wood isn't right for your needs, but you like the look. The benefits and disadvantages of tile and wood seem to cancel each other out, so it's if you've read through the above and still question which is best, it's time to turn to a designer perspective. 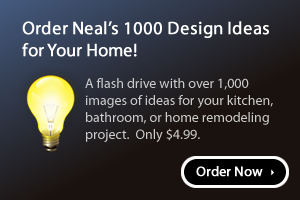 Look at the flooring in the rest of your home. Ask yourself if using tile or wood would add a welcome difference, compliment other rooms, or be a jarring or weird change. Do you want the kitchen to feel connected to the rest of the first floor, or as a separate space with its own personality? Finally, when all else fails, think about what was on the floor in kitchens you love being in, even as you were growing up, or in places you've visited only once. In the end, between tile and wood, you can't really go wrong.